Carlisle’s weighing systems coupled together with Carlisle’s iCap Weigh / Label software transform into an intelligent data collection weigh / label solution able to manage product files, label formats, tare weights, over/under check weigh, accommodate standard or catch-weigh products, track giveaway and much more. True centralized product file management, production / inventory insight, and Traceability is achieved when used in conjunction with Carlisle’s Symphony software solution. BenchMark’s heavy-duty construction provides ultimate durability, sensitivity and long life for a variety of demanding weighing environments. 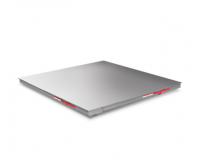 Five standard platform sizes offer a wide variety of capacities. The CW-90X is built for the demanding, heavy-duty environments of today’s food processing industry. Starting with its IP69K rating, you won’t find a more robust checkweigher on the market. Carlisle provides reliable, fast, food-grade conveyor scales that can handle a variety of box sizes and line speeds, and can be easily integrated into your plant’s other system components. Carlisle Weigh / Label workstations are known throughout the industry for their sanitation-friendly rugged construction, ease of use, and reliability within the harshest processing environments. This NTEP‑approved, high accuracy, in‑motion monorail scale is the solution that provides you with the most precise weighments. Perfect for weighing beef sides, lamb carcasses, or pork carcasses, this monorail scale can be closely matched to your plant throughput requirements to maximize accuracy and speed.